Oh my goodness! Can you believe that we are already done with one gorgeous piece? Hopefully you are having fun showing off your finished shawls and now you're ready to make a quick and pretty Shawlette! If you'd like, you can see the entire crochet along schedule & details about getting started here. 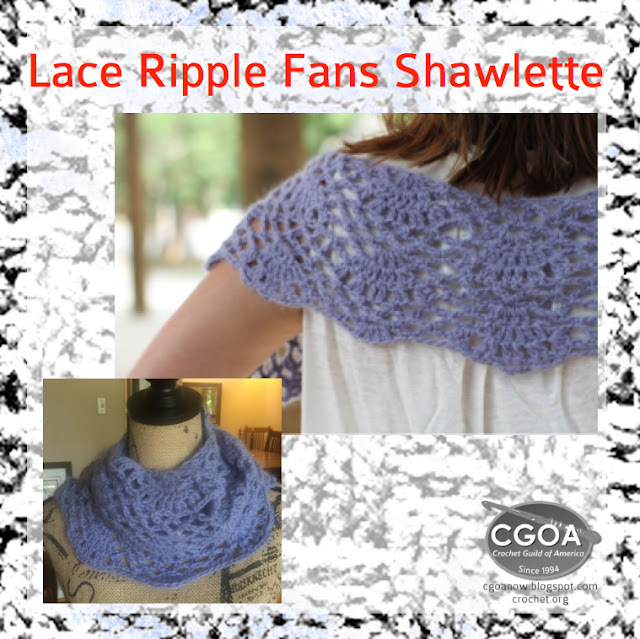 Lace Ripple Fans is a versatile, rectangular-shaped shawlette stitched in a lovely, open lace pattern. Stitched in long rows using DK weight yarn and a big hook, the piece works up quickly and can be styled in many ways. Whether loosely wrapped around the neck like a cowl, or draped over the shoulders and styled with a pin, this piece is a showstopper. 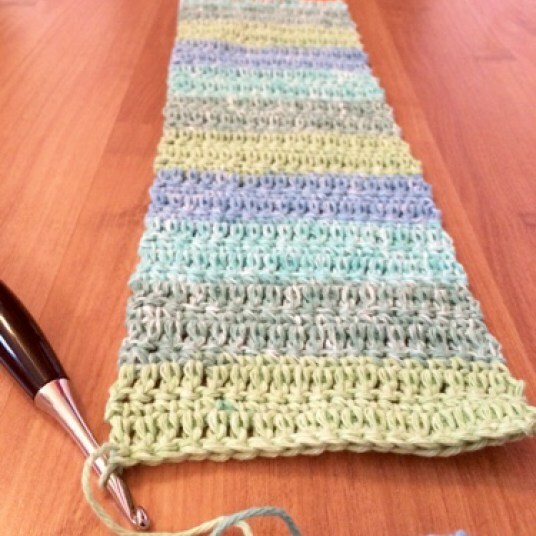 Enjoy crocheting this gorgeous piece and you'll want to make more! We'll be crocheting this in just two parts: doing half in one week, and half + finishing in the second week. So in just two weeks, you will have a lovely, new accessory to gift or wear. 2. Share progress pictures and ask questions in the Facebook group and in our Ravelry thread. We'll help each other out! We are very fortunate that we have several excellent sponsors who have really stepped up to make this CAL lots of fun for us! At the end of the CAL, you can enter to win a fantastic prize package!! Let's keep the conversation going. 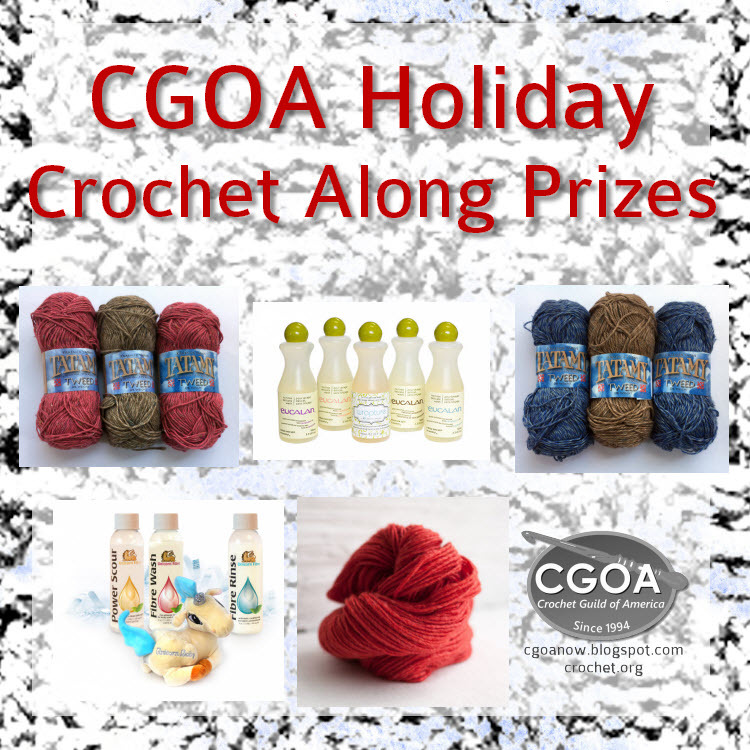 If you're not already a member of the CGOA Crochet Along Facebook group or Ravelry group, please join us so we can all stitch together! Do you want to connect with me on social media? Caissa (@artlikebread) can be found on facebook, Instagram, and SnapChat (It's fun!). Join my newsletter about crafts, crochet, and education. 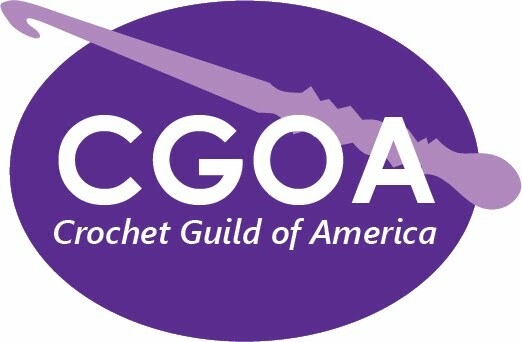 I'm Marie from Underground Crafter and this is my tenth post in a series where I spotlight a Crochet Guild of America member with an interview. This month's interview features Jess Mason from Screen to Stitch, a crochet designer and fiber artist community manager. Jess learned to crochet as a teen from her grandmother and has been designing patterns for the past several years. You can find Jess on Screen to Stitch. She is also on Ravelry and members of her Facebook group get access to free patterns a week early. All images are used with permission and are © Jess Mason/Screen to Stitch. 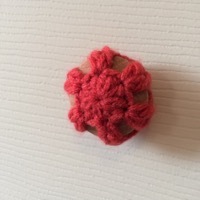 Yarn Bombed Door Knob, free crochet pattern by Screen to Stitch. Jess: I started crocheting at about 15 when my grandma taught me to chain. It was all I could do when I started, so I think I chained an entire skein of yarn to practice! Then my grandma taught me to single and double crochet. From there, I hopped on YouTube and the rest is history! Batik Zipper Pouch, premium crochet pattern by Screen to Stitch. Jess: I started designing in 2013. I didn’t really think much would come of it, I just wanted to have a bit of fun! Jess: I’ve been a member for two years. I love connecting with other members. I don’t have many friends that crochet, so being able to connect and chat with other crocheters is just a blast! Zen Blanket, free crochet pattern by Screen to Stitch. Jess: Scrap blankets! Whenever I really want to zone out and relax, I work on simple, mindless projects like the Zen Blanket. Cutie Acorns in 3 Sizes, premium crochet pattern by Screen to Stitch. Jess: Amigurumi…I love learning new construction techniques and different ways to make shapes with crochet. 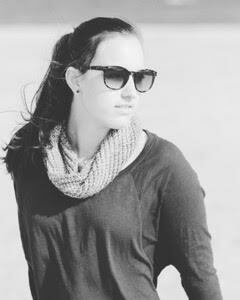 Jess: Hats and scarves, because there are so many different designs out there so there’s something for everyone. Scrappy Snake, crochet pattern by Screen to Stitch in October, 2016 issue of Happily Hooked. UC: What are your favorite types of crochet projects for colder weather? Jess: Big, squishy cowls! I especially like this one from Purl Soho. 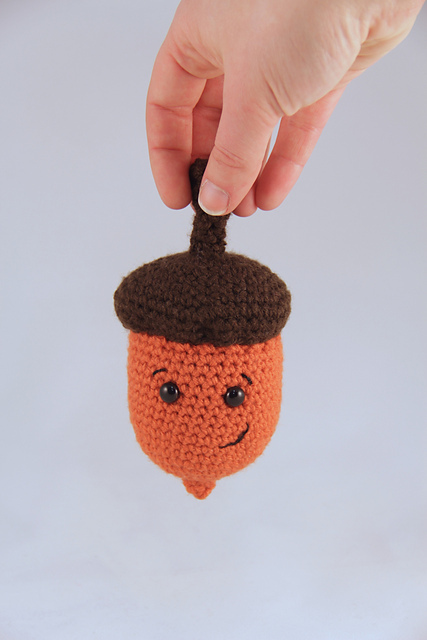 Uni-CORN, free crochet pattern by Screen to Stitch. Jess: 2016 is the year of connection! I’m building an awesome and fun Facebook community and that’s where I’m spending a lot of my time nowadays! I just love seeing people’s projects, answering questions and connecting with my fans! What’s next?! More patterns, more fun, more connection! ;) If you want to get in on some of that, join the place where it all goes down, my email list. Thanks for sharing your love of crochet with us, Jess! Hooray! Now that you've crocheted the entire base, you can finish your gorgeous shawl inspired by all the stars in the sky! All the Stars Above is a beautiful, L-shaped shawl made using a large hook and DK weight yarn for elegant drape. We have been crocheting this beauty in three parts: doing half in one week, half in the second week, (pausing a week to catch up), and doing all the finishing in the final week. So by the end of October, you should have a lovely shawl to wear or share. 1. Complete your finishing for All the Stars Above. 3. If you haven't already, gather materials for our next project - Lace Ripple Fans Shawlette by Susan White Sullivan. Join one of our groups and join in on the fun! 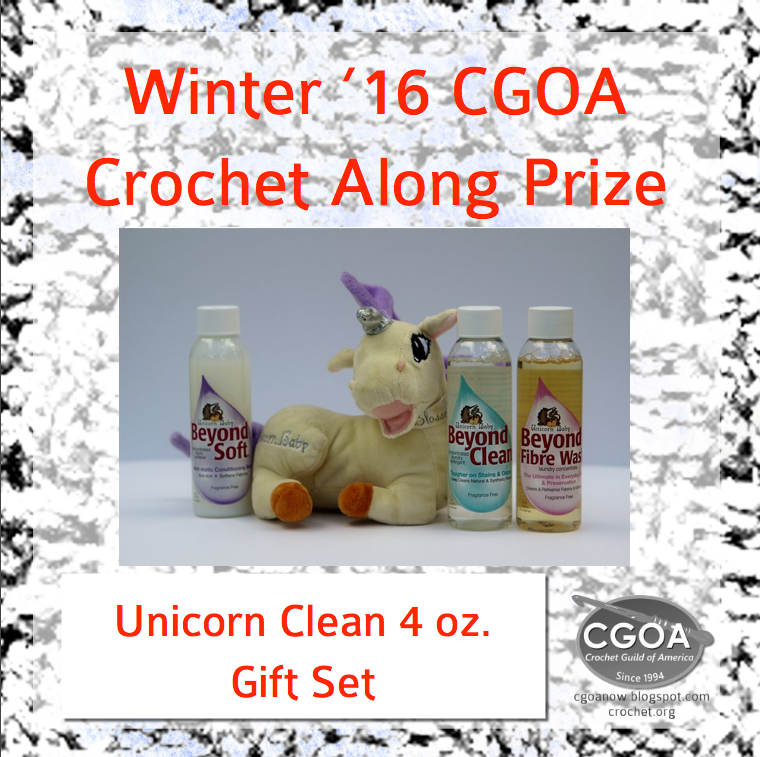 Our friends at Unicorn Clean (formerly Unicorn Fibre) are offering two wonderful 4 oz prize packs with samples of Power Scour, Fibre Wash, and Fibre Rinse. Each pack also includes a cute, stuffed unicorn and is packaged in a gift box! The CAL is not over yet! We're digging into a luscious new pattern next week! How have you been keeping up? It depends on how quickly you crochet, but I think we might need a little more time with this pattern. What do you think? 1. Catch up on any crocheting for All the Stars Above. 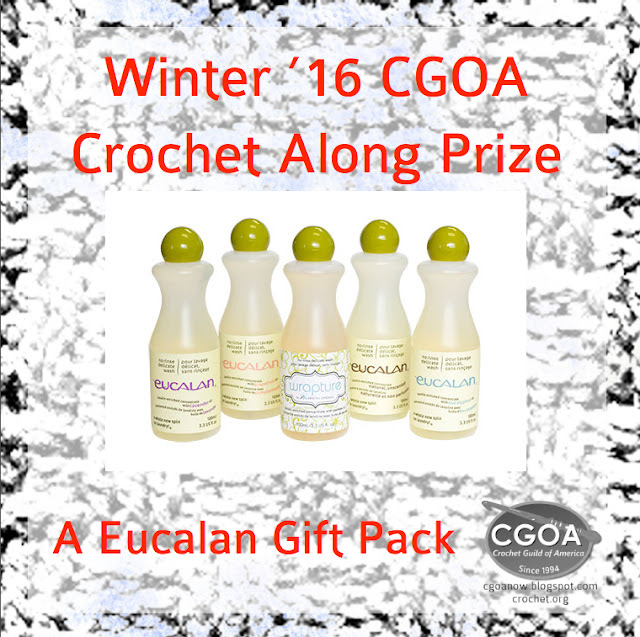 Eucalan is well known and trusted by yarn crafters to take care of their precious creations. This is a product I use and I love it because it is no-rinse and it is great for blocking and handwashing! Eucalan is offering a prize gift pack. Eucalan is generously offering shipment to the United States and Canada! I am eyeing this gift pack because think of how cool it would be to have a travel-sized bottle to bring with you on a trip. Or also how extra special it would be to add a bottle to your handmade gifts. I really like how this item can take handmade creations to the next level. This novel is not about crochet or knitting. It's a gripping, historical fiction about starting over. Fiber arts play a role in the story, but are not the central focus. As the book begins, the main character, Ailee Donaghue, is about to leave everything she knows behind, to start a new life with a new husband in a new world. Behind her is the stigma of a past mistake, and in front of her a lifestyle she is unprepared for. The physical journey is grueling, but the emotional journey is just as much so. Through hardship, joy, love, friendship, and devastating loss, Ailee begins to grow and discover hidden strengths she had never imagined. Against this backdrop, we also see the beginnings of crochet in the new world. Ailee is a horrible knitter, but discovers a secret stitch that is much easier for her to do. It uses an oddly shaped tool and is wrapped up in handed down stories of cowls that protect the wearer from various dangers. Just superstitions....or are they? As a bonus, the pattern for this special cowl is in the back of the book! 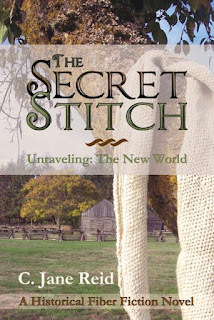 When I got The Secret Stitch, I sat down to read it, thinking I could make it through the first chapter in the few minutes I had before bed. 4 hours and many chapters later, I struggled to put it down because I knew I had to get SOME sleep eventually. I loved this book, and I can't wait to read the rest of the series. 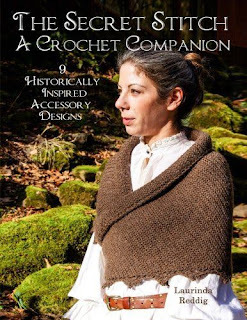 This crochet pattern book features 9 patterns inspired by the novel. One of the designs is Ailee's version of the cowl that so intrigued her, made with her newly discovered secret stitch. All the designs are historically inspired, but with modern twists that make them perfectly wearable today. Some of you may know the author/designer, Laurinda Reddig. 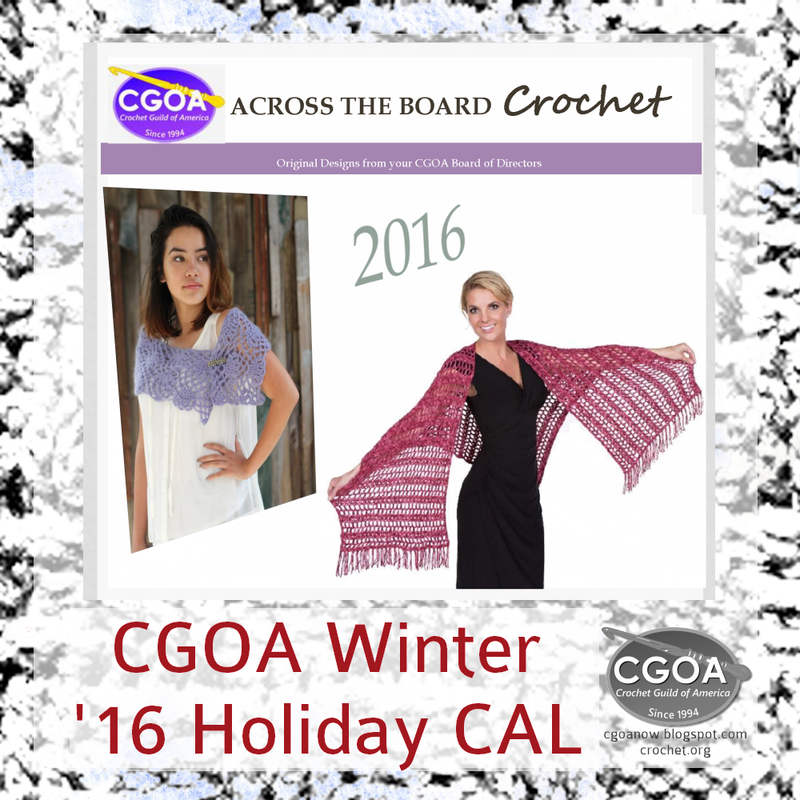 I've taken a few of her fabulously fun classes at the CGOA Knit and Crochet Show over the last couple of years. As I would expect, knowing her work, the designs are creative and the patterns are well written. The book also has tutorials for some of the less common techniques, and suggestions for modifying the designs to make them your own. Together, these two books are a fantastic set. I got completely drawn into the story, and I love the designs. They are both available on Amazon, but you can also enter to win a copy in the Spa Basket Crochet Along. There are a lot of other great prizes too! 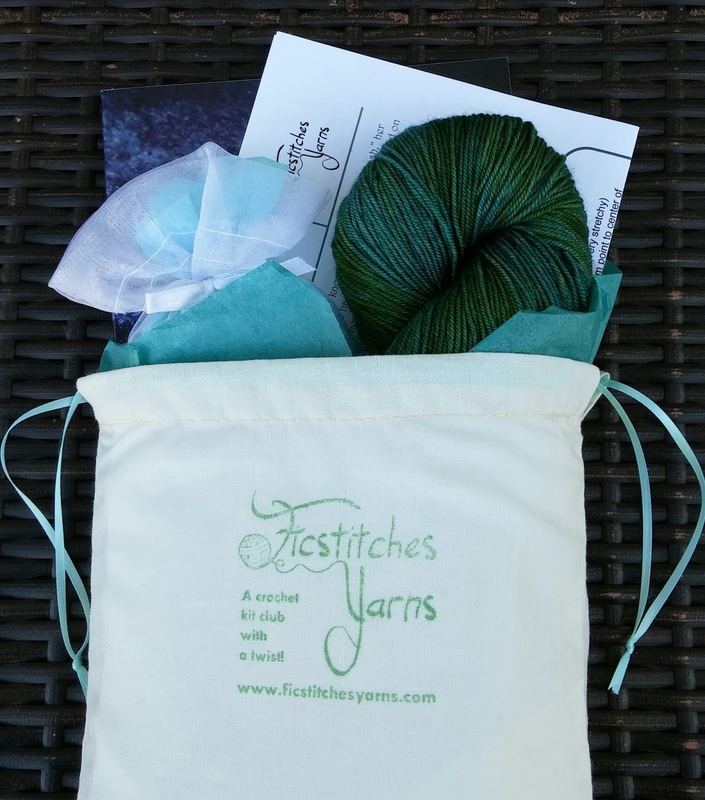 If you like the idea of combining crochet patterns with stories that inspire them, be sure to check out Ficstitches Yarns Crochet Kit Club. Each kit in the club features a story by C. Jane Reid, and a corresponding pattern from Laurinda Reddig! Disclaimer: A free review copy of The Secret Stitch and The Secret Stitch a Crochet Companion were provided by Ficstitches Yarns Crochet Kit Club. Although I accept free products for review, I do not accept additional compensation, nor do I guarantee a positive review. My reviews are based entirely on my honest opinions. All images of copyrighted material are used with permission. So how is your hook? I have been loving working the beautiful star stitch in All the Stars Above pattern. All the Stars Above is a beautiful, L-shaped shawl made using a large hook and DK weight yarn for elegant drape. If you're familiar with the star stitch, you'll adore its relaxing repetition. 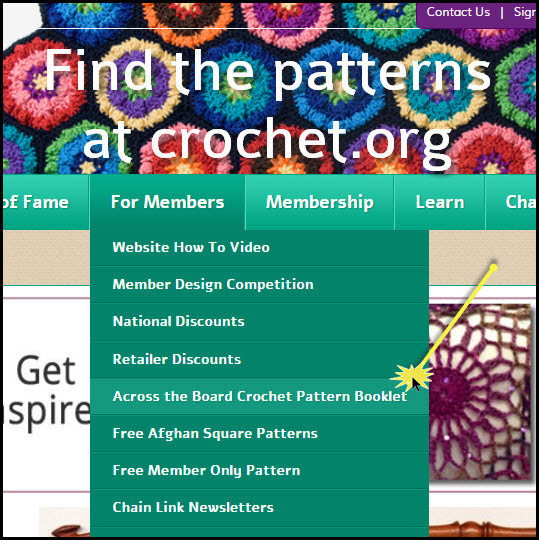 If you're new to the star stitch, you'll have a new skill to add to your crochet knowledge base. We'll be crocheting this beauty in three parts: doing half in one week, half in the second week, (pausing a week to catch up), and doing all the finishing in the final week. So by the end of October, you should have a lovely shawl to wear or share. Stitch with us! It is not too late to join! Fairmount Fibers is the US distributor of the luscious Manos del Uruguay yarns. 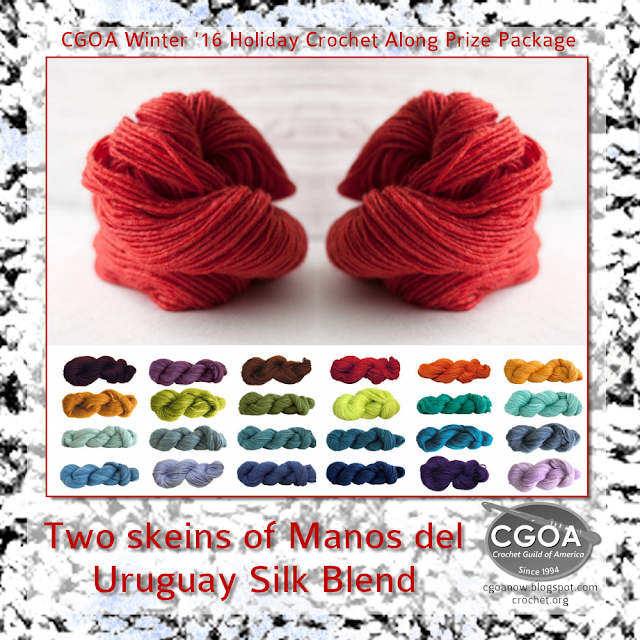 They are offering a prize package consisting of two skeins of their new Silk Blend in winner’s choice of color, semi-solid, or space-dyed. This is enough to make the Lace Ripple Fans Shawlette! Are you squealing yet? "New for 2016: Soft and shiny, Silk Blend gives good stitch definition to cables and other texture patterns. Its jewel-like colors work beautifully in stranded colorwork designs." Location: Crittenden - a small town in northern Kentucky. I grew up here, lived in California for 30 years, and have returned to my roots for retirement. I've been crocheting, with varying intensities, for about 45 years. My grandmother taught me to crochet, and my interest was rekindled in the 8th grade by a teacher who taught us after school. My grandmother crocheted beautiful doilies, and I proudly display many of them in my home. I also remember a hideous scarf that we worked on together. It was about 8 feet long, maroon, with horizontal stripes of white, red, teal, and yellow. In school, I distinctly remember a few crochet projects. One was a neon green acrylic bikini, and another was a very large (and heavy) purple cotton mouse pillow. 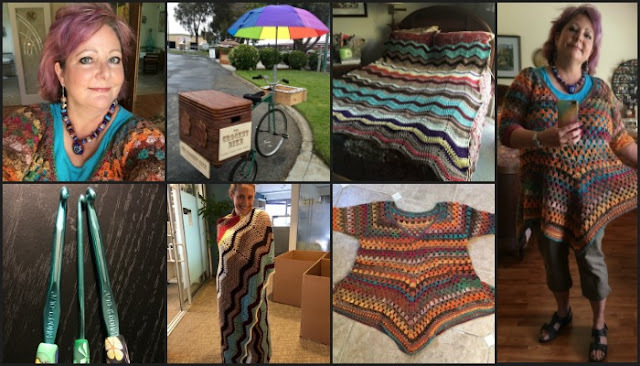 In college, I completed an Annie's afghan kit, which my parents use to this day. I crochet right-handed, with a knife hold. I don't remember this being a choice, it's just what I've always done. When working with worsted weight yarn, I prefer an H or I Boye hook. I've become quite fond of the clay grips, and usually have a hook grip design from Day by Day Crochet in my hand. I suppose as our experience grows, our taste evolves. Since I've begun creating garments, a dk weight is my favorite. It has a nice drape. I enjoy alpaca, and any interesting mixes - silk, bamboo, linen, hemp, etc. My new home has a lot of heat and humidity, so open designs in lighter fibers are a new interest. The most intriguing stitch to me right now is a cable stitch. I find it to be more challenging. For me, crochet patterns and stitches are like puzzles, and a complex cable stitch is a great brain teaser. I have always had a knack for reading patterns. I've taken classes in chart reading, and can do it, but prefer to use the chart as confirmation, or as a backup in case I get stuck. I don't like following videos to make projects. I like puzzling it out for myself, and also controlling my own pace. To me, following a pattern is like reading the book, and the video is watching the movie. Creating a crocheted garment has always been my ultimate goal. Once I found the Get Squared program, created by Jenny King, I've been able to have great success creating garments. I also enjoy shawls because of the interesting patterns and possibilities, as well as their versatility. Shawls can be draped over a chair, incorporated in an outfit, wrapped around the waist or head, used as a robe (at home or traveling), one size fits all, and they are a welcome gift. Who do you crochet for? Yourself, family, friends, pets, charities? At the risk of being called a "selfish crocheter," I have to say that I crochet for myself. I've made hats and sweaters for new babies, an afghan for a friend's wedding, shawls and slippers for friends. But there is always the fear of being crushed by a recipient who won't like the item, or won't use it. At one time, I began yarn bombing an adult tricycle with an attached "trunk," called The Crochet Bike. I taught crochet out of the trunk, and could also ride the bike around. I've used The Crochet Bike when demonstrating at Michael's, and also at The Maker Faire. How long have you been a CGOA member, and what is a fond memory from a CGOA Conference that you’ve attended? I've belonged to the CGOA for 6 years. Stitches West was near my home in California, but I wept tears of joy when I discovered the CGOA annual meeting. I've attended 2015 in San Diego, as well as 2016 in Charleston, and am looking forward to Chicago in 2017! My favorite memory was participating in the fashion show in 2015 modeling my Get Squared cardigan, and hearing ahhs from the audience when it was revealed that I made the cardigan in one weekend. There isn't a CGOA chapter in Northern Kentucky where I live, and one of my goals is to change that by starting a group. I believe that we all have a "crochet calling," an area that ignites our passion. Mine happens to be teaching. I have no children, and I believe that my legacy - the evidence that I have walked this earth and that it is different for my time here - is to pass along the skill of crochet to others. I've taught at Michael's for 5 years, and am looking forward to teaching classes on Get Squared for Jenny King. Large Bobby pins make good stitch markers, and are easy to reposition. Dental floss containers are fine yarn cutters when traveling. Print out the TSA regulations for hobbies and carry them with you. Photocopy patterns from books and magazines for portability and so that you can mark on them. Bags that hold produce at the grocery become good yarn carriers and dispensers. Choose the crinkly bags with a zipper top and holes for ventilation (contain mini bell peppers, cherries, grapes, etc), wash and air dry. Zip your cake of yarn into the bag, using the ventilation hole for dispensing. I invite my parents, Hazel (87) and Leo (88) to dinner once a week. It's a chance for me to try new recipes, be creative, use some of my nice things, and to honor them. I enjoy crafty things, like coloring, cold process soap making, creating bath salt mixtures, and decorating. In addition to my parents, my supportive boyfriend Tim lives nearby. I retired this year from my career as a sales trainer for a biotech company, and couldn't be happier with my new life. Mix together 1 box of spice cake mix and 1 can (15 oz) of pure pumpkin. Pour into a greased pan and bake at 325-350 for 20-25 minutes. Are you ready? I am so excited to get this crochet along going, so let's get our hooks moving on the lovely All the Stars Above pattern. 3. Share progress pictures and ask questions in the Facebook group and in our Ravelry thread. We'll help each other out! 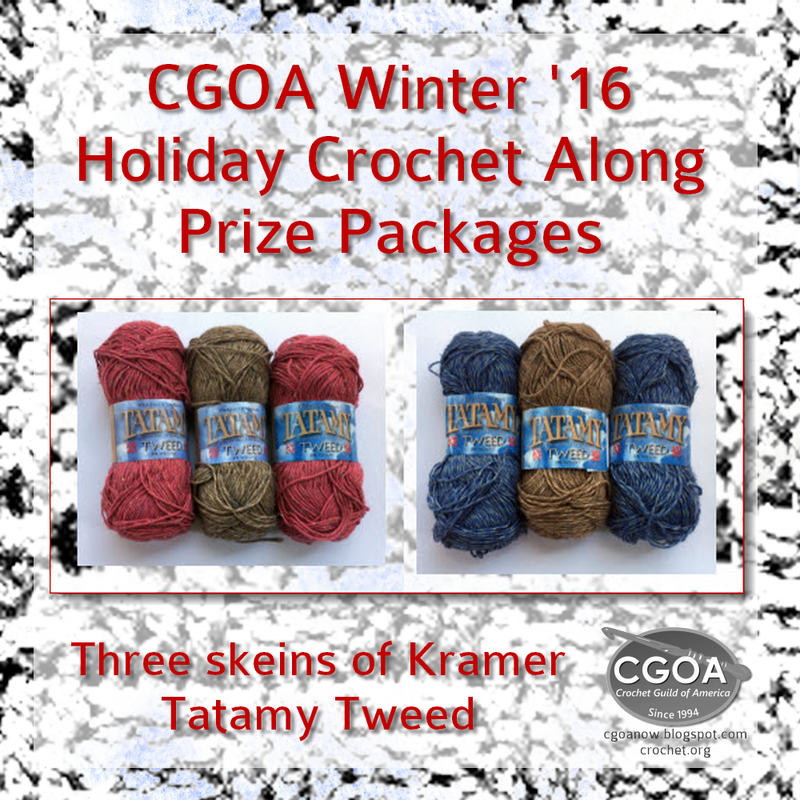 Kraemer Yarns is generously offering two prize packages, each containing three skeins of Tatamy Tweed DK weight yarn! 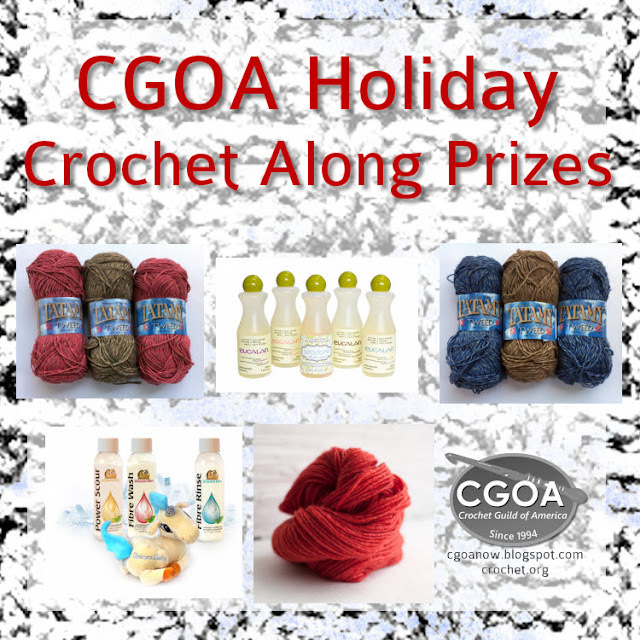 If you win, your prize will consist of either two skeins of Rose and one skein of Taupe or two skeins of Blue Jeans and one skein of Taupe. "Tatamy Tweed is a D.K. weight, easy-care, cotton/acrylic blend. It comes in 28 lovely colors ranging from bright and playful to neutral earthy tones, all with small flecks spun right into the yarn. Because Tatamy Tweed is machine washable, it is an excellent choice for everyday garments. It is fabulous for summer sweaters, tops, hats, and even skirts! When you don't want the overwhelming warmth of wool, Tatamy Tweed is a cool, easy-care solution. Made in the U.S.A."